REX Robinson hasn't always played the trombone. In fact, it wasn't until he was 60 that he took the plunge and immersed himself in the learning of the brass instrument. 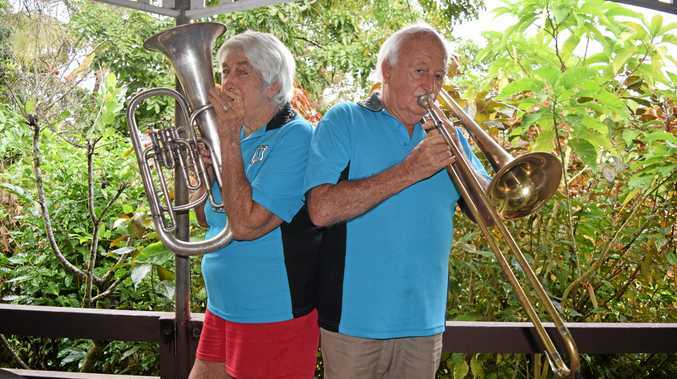 Mr Robinson and his wife came along to a rehearsal of the Proserpine Citizens' Band and made a decision to join. The rest is history as he continues to play with a group of musicians who have been entertaining crowds for 105 years in Proserpine. Now in his 80s, Mr Robinson said he was the oldest member of the band. "There is no limit to anyone who wants to become a musician. They can join the band and learn,” he said. In an era where many small-town brass bands are disbanding, Mr Robinson said the Proserpine band was alive and well, though they were constantly seeking new members. Sharing the buzz he gets from being part of something that is more than the sum of its parts, he said: "you really feel you are part of a group and making a contribution”. "The best way I can describe it is: I love flying, the feeling of taking off and landing. That is the same sort of feeling I get when I play with the band,” he said. The band plays a wide variety of music, from Abba to Queen to Phantom of the Opera and all the classic numbers you would expect to hear from a brass band. The band meets every Tuesday from 7-9pm in Chapman St and is always looking for players, particularly, saxophone, clarinet and tuba. The band will be performing at the Proserpine Flower Show on September 3 at the Uniting Church from 10am to 2.30pm.